Why do you want to write for Rescripted? : I whole-heartedly believe in Rescripted’s mission, honestly engaging with the work of our peers in our city as well as allowing a space for young and aspiring critics of color . What are your artistic disciplines? : Dramaturg, script reader, consultant, writer, political lens. What “lenses” do you bring with you when you go to a show? : Dramaturg, Latinx lens, social justice lens, philanthropic lens. Who is your favorite theatre artist and why? : Oooh this is a tricky question! But, my favorite theatre artist would have to be Young Jean Lee because she constantly pushes the boundary and expectation of what we’re taught theatre is. She blows my mind-with the form she masterfully creates-every time I reread one of her plays. Bio/Website: Hannah Greenspan-Herrera is a Chicago based dramaturg and philanthropist, originally from Los Angeles, California. 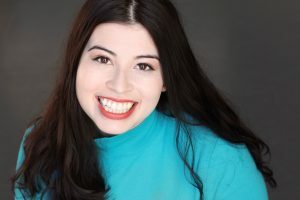 As a dramaturg, Hannah is drawn to plays that tell untold histories or narratives, plays that hone in on the Latinx experience, and radically political new plays. Her most notable Chicago dramaturgy credits include: Romeo and Juliet, The Deflowerment of Wendy Diaz, and Augusta and Noble (The Theatre School, DePaul University). Chicago companies she’s worked with include, Victory Gardens Theater (Literary Management and Civic Dramaturgy Intern, 2016), American Theater Company (Education and Youth Ensemble Fellow, 2017), and First Floor Theater (Literary Assistant, 2017). Dramaturgically, Hannah implements various forms of dramaturgy in her work such as collaborative dramaturgy, civic dramaturgy, and live action dramaturgy. As a philanthropist, she serves as the Assistant Director of Dancer Relations for DemonTHON, a professional organization committed to making miracles possible for critically ill children and their families. She is a graduate of The Theatre School at DePaul University. Learn more at www.hannahgreenspan.com.